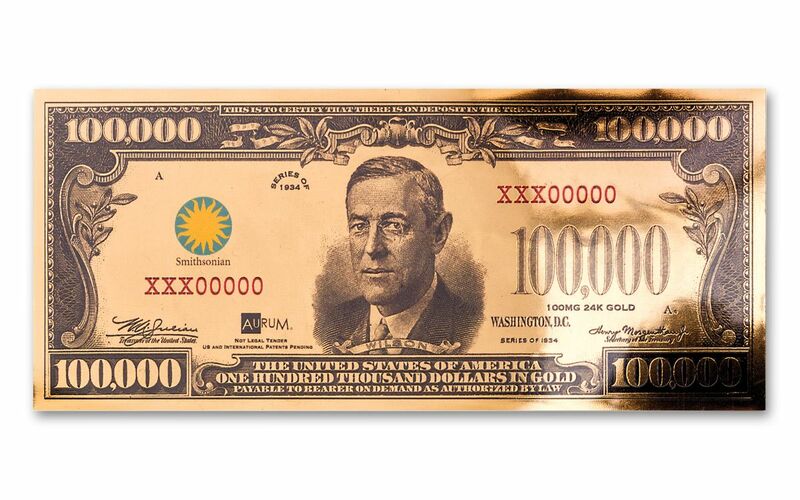 The Legendary $100,000 Bill, Struck in 24 Karat Gold! Let's say you're running a bank in 1934, where your transactions are recorded by ink, typewriter ribbon and paper. Let's also say that, at one point, you needed to transfer money to another bank. Since this is well before the time of computerized balances, you couldn't wire the money like you can today. You could send the amount in gold, but carrying the equivalent in bars down the street would hardly be inconspicuous. And, frankly, a friendly paper IOU never holds up as legal tender. You needed a way to do it fast, do it simply and do it in a way that was U.S. government-guaranteed. Enter the $100,000 bill. This gold certificate was the highest denomination ever issued by the United States. Used to transfer funds between banks, these notes were never meant for general circulation. In fact, bills like these were illegal to privately own. (Not that the average citizen realistically could -- back in 1934, these bills were each worth around 1.8 million in today's dollars!) When the Federal Reserve stopped using these types of notes in the 1960s, the vast majority were destroyed. However, you can still see one in person at the Smithsonian Institution's National Museum of American History. 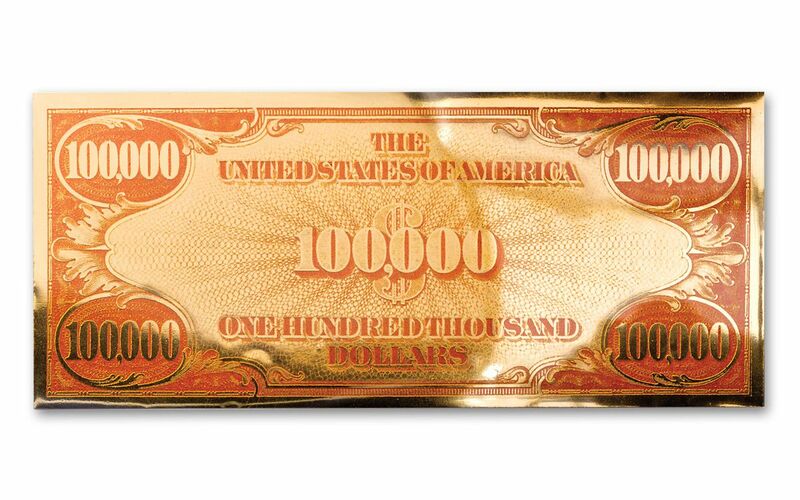 And now, you can own a gorgeous 24 karat gold currency strike of this famous design! A HISTORIC DESIGN IS REBORN!-- This new currency strike recreates the original 1934 design of the $100,000 bill in exacting detail. Your eyes immediately meet the stoic gaze of Woodrow Wilson, the 28th President of the United States from 1913 to 1921. Leading the country through World War I, Wilson was a prime figure during the Versailles Peace Conference and created the League of Nations -- the precursor to the United Nations. AMONG THE FIRST OF THEIR KIND!-- Using state-of-the-art technology, 100 milligrams of 24 karat gold are transformed into a single currency-sized work of art. Spread over this lustrous canvas, the design of each currency strike literally shines! These gold certificates are among the very first to be created through this newly-developed process. 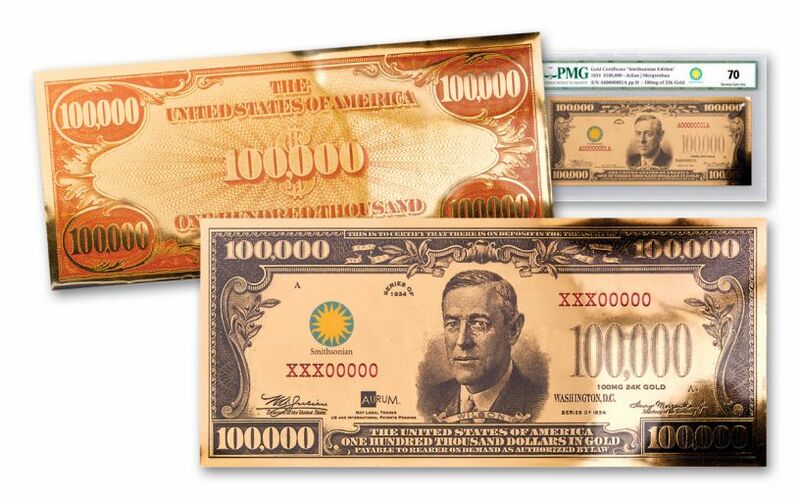 OFFICIALLY LICENSED BY THE SMITHSONIAN!-- Since the original 1934 $100,000 bill is a big attraction in the Smithsonian Institution's numismatic collection, we're honored to present this currency strike as an officially licensed Smithsonian release. For proof, look to the left of Woodrow Wilson's portrait for the Smithsonian Institution's sun logo! CERTIFIED FLAWLESS-- Your currency strike will also come graded 70 Gem Uncirculated (70 Gem Unc) by Paper Money Guaranty (PMG), a distinction that means your perfectly-graded gold certificate will have ZERO imperfections -- showing all details exactly as the mint intended! In addition, your currency strike will be sealed in PMG's new holder, giving you clear visibility along with superior protection. A LIMITED-MINTAGE RELEASE! -- Only 5,000 of these currency strikes will be produced for collectors worldwide! If you're a fan of American history, large bills, new technology or all of the above, this 24 karat gold currency strike is definitely one to own! Just don't wait too long -- certificates made with this new technology have already become massive hits with collectors. Ring one up in your cart today!